LEXINGTON, Ky. (April 11, 2019) — Home to the first PhD program in Kentucky and the first Doctor of Nursing Practice (DNP) program in the nation, the University of Kentucky College of Nursing produces nurse scientists, educators and practitioners who are dedicated to improving the health of communities around the world. Janie Heath, PhD, is proud to serve as the fifth dean of the College. In this Campus Walk, Heath highlights how the college’s rigorous academics, internationally-recognized nurse faculty and clinical learning opportunities with community partners gives its students a clear competitive advantage after graduation. 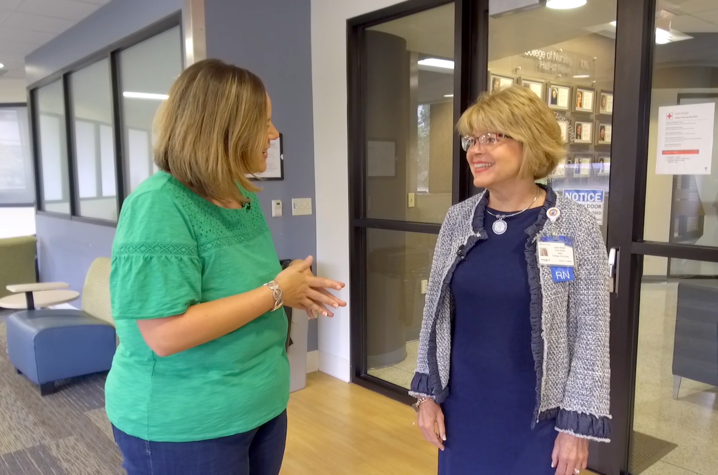 Watch the video above to discover how the College of Nursing is also working to change lives through groundbreaking, interdisciplinary research. Heath was appointed dean and Warwick Professor of Nursing for the College on Aug. 1, 2014. She was formerly an endowed professor of nursing and the chief academic officer at the University of Virginia and the Medical College of Georgia. She has provided academic leadership for Acute Care Nurse Practitioner and Critical-Care Clinical Nurse Specialist Programs at Georgetown University in Washington and at the University of South Carolina. She earned her Master of Science Degree, with a clinical nurse specialist focus, from the University of Oklahoma and her postmaster’s with an acute-adult nurse practitioner focus from the University of South Carolina. She completed her PhD in nursing from George Mason University in Fairfax, Virgina, in 2004. She has more than 43 years of acute and critical care nursing experience in various positions from staff to administration to advanced practice and academic leadership. She has been awarded more than $12 million for academic and/or research initiatives, generated more than 150 publications and abstracts, served on numerous regional and national task forces for tobacco control and advanced practice nursing initiatives. Heath’s primary research program of study involves workforce development for resilient and ethical practices and effective interventions with tobacco-dependent populations in acute and primary care settings. In addition, Heath served as a member of the board of directors for the American Association of Critical-Care Nurses (AACN), founded the Nurses for Tobacco Control National Coalition for Nurse Educators (NTCC) and was appointed the inaugural Distinguished Alumni of Nursing at the University of Oklahoma. She is a Fellow of the American Academy of Nursing, the National Academies of Practice and the American Association of Nurse Practitioners.